Tony Stewart is former professional stock car racing driver and NASCAR team owner. He is also a four-time Sprint Cup Series champion as a driver and owner. He is the only driver in history to win a championship in both IndyCar and NASCAR. So earning over $120 million as a NASCAR driver for this guy isn’t impossible. 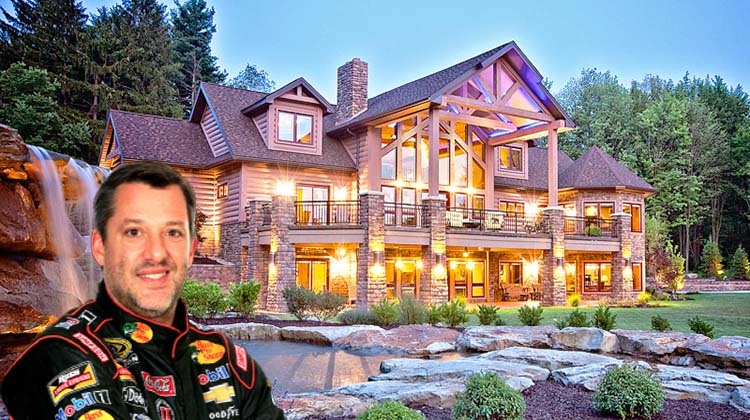 Tony Stewart’s custom built log home in his hometown of Columbus, Indiana sits on 414 acres of land. The construction of his dream home took two years to complete. The 15,756 square foot cabin has 6 bedrooms, 12 bathrooms, and 10 parking spaces. Besides the race cars hanging from the walls, Stewart’s home also has a 1,600 square foot aquarium, a two-lane bowling alley, and an entertainment room with more TV’s than Walmart! Now that’s what you call a dream home.